Dogecoin’s Recent 160% Gain: Why? and What’s the Relation to Altcoin Seasons? The crypto space has seen dozens of projects lose close to 90% of their value. Some coins have not only maintained a stable price but have even flourished in this bear market. The most surprising of these coins is Dogecoin. During August and September, Dogecoin rose by almost 160% while the majority of Altcoins lost more than 10% of their value at the same time. This is especially surprising when we keep in mind the fact that Dogecoin is considered a ‘parody’ cryptocurrency to most; a coin that was developed as a joke to see if it would get traction during the crypto bull market of 2013 (and it certainly did). Dogecoin stated utility is for buying goods and services (just like bitcoin). However, it also serves as a currency for tipping content creators on the Internet. Although dozens of other cryptocurrencies have the same utility, Dogecoin seems to have succeeded in forming a loyal and supportive community of users dedicated to holding, and most importantly, spending the coin on a regular basis. In fact, as of June 2018, Dogecoin was processing 300% more transactions than Bitcoin Cash. This is even more impressive when we consider the fact that Bitcoin Cash’s whole purpose for existing was to become a more ‘transaction friendly’ alternative to Bitcoin. It’s always hard to determine precisely what event kicks off a price rally for any particular coin. However, for Dogecoin, it seems that the recent listing by the popular stock and crypto trading app Robinhood may have got the crypto investors excited. Robinhood announced in mid-June, which led to a solid price spike, followed by a much larger one a month later. Robinhood is most popular amongst millennial investors, which made Dogecoin a welcome fit to their roster of cryptocurrencies. “As Robinhood is looking to establish itself as a cost-effective and reliable alternative for crypto exchanges, much like it did with traditional stock exchanges, it provides an entrance into the crypto landscape for the average investor,” says Chang. 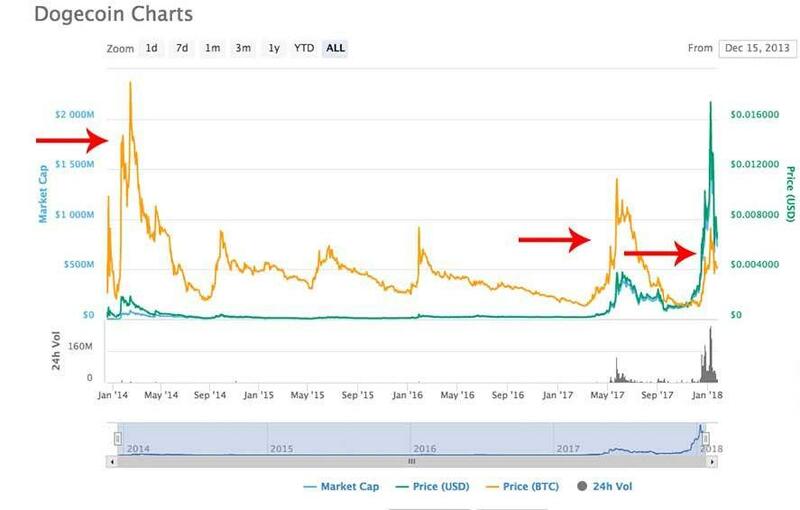 Historically, whenever Dogecoin has done very well, it’s usually been a sign that we’ve reached the peak of Alt Season, as almost all other altcoins with real value have already pumped, and so traders are looking to go down to list to see if the joke coins will also pump. This means the market is closely approaching the end of a bull cycle. However, a price rally in Dogecoin has occasionally triggered the opposite reaction in the markets.